...especially if you are an under 11 girl! I remember how much I hated playing in the wind and rain whilst watching the girls today. Rain is ok but wind and rain together is most definitely not. Anyway despite the horrific conditions the girls managed to win 3-2 against a spirited Rainham Kenilworth thanks to the last minute poaching instinct of our right winger. We had another good group of 7 volunteers out today in Larkfield and we managed to cover the Tree Estate. The response was very positive on the doorstep and most people we spoke to were pleased to see us out enquiring about local issues we could help with. As an additional bonus, having picked up the keys to my new house yesterday I rather usefully met a local window cleaner (who doesn't go as far as Aylesford but had a contact) and a local builder (who gave me his business card). No lunch today as everyone appears to rather belatedly have started their New Year's diet...mind you given how desperately sad everyone looked as they departed for their homes hungry and thirsty, I am pretty sure we'll be back in the local pubs next week!! When I got into my car this morning it said it was -3 on the temperature gauge, it took me 5 minutes to scrap the ice off my car and then it started to snow. So I was slightly nervous about how many people would turn out this morning for a campaign session in Larkfield. I need not have worried - we had 7 and as a result we managed to cover a huge area. As always I thoroughly enjoyed our morning canvass and got to meet lots of really interesting people, and whilst the conversations were understandably shorter due to the cold, the reception was very warm. Many were aware of David Cameron's forthcoming visit and some are attending so am looking forward to seeing them again. Despite wearing 5 layers (vest, shirt, jumper, suit jacket, overcoat), scarf, gloves and furry lined boots I and the team were forced to retire after two hours, just before frost bite set in, and headed off to a warm pub for lunch. Two cups of coffee and a ham, egg and chips later I finally began to feel the ends of my fingers but the morning spent in the cold was definitely worth it. 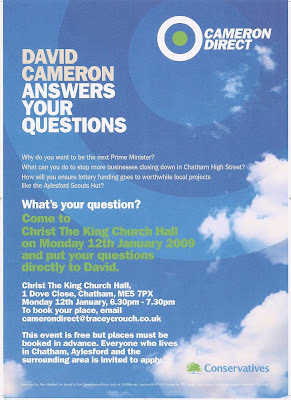 David Cameron is doing his first Cameron Direct in Kent here in Chatham & Aylesford next Monday. Cameron Direct has proved to be a really popular event whereby he comes face to face with so far undecided voters and the feedback has been amazing. I am of course delighted David Cameron is coming to the constituency not least because it is a fantastic opportunity for anyone of any political persuasion to come along and raise their issues, questions and concerns with him. Members of the public set the agenda for the evening so whether the question, issue or concern is about the global economic downturn or local anti-social behaviour, it will be answered by David Cameron in person. Popular political blogger, friend and all round good guy Iain Dale has posted two twitterings in the last 24 hours - one HERE about how he hoped Spurs would lose to Wigan and one HERE about helping fellow candidate Simon Jones deliver newspapers in Dagenham today.